Summary: Introducing the lifesaving cookbook for every mother with kids at home—the book that solves the 20 most common cooking dilemmas. What’s your predicament: breakfast on a harried school morning? The Mom 100’s got it—Personalized Pizzas are not only fast but are nutritious, and hey, it doesn’t get any better than pizza for breakfast. Kids making noise about the same old lunch? The Mom 100’s got it—three different Turkey Wraps, plus a Wrap Blueprint delivers enough variety to last for years. I can't believe it took me this long to actually start using THE MOM 100 COOKBOOK: 100 RECIPES EVERY MOM NEEDS IN HER BACK POCKET by Katie Workman. I received a copy of this wonderful cookbook at this year's BEA Workman Party, and I even spent some time talking to the author about cooking for a family and just being a mom. (She's delightful and gorgeous in case you're wondering!) I had a feeling that I'd like some of these recipes, but what I didn't realize just how great this entire cookbook is. I could just kick myself that I didn't get around to sampling some of these recipes! As a book blogger, I am so incredibly fortunate that I get a wide variety of cookbook to review. It's rare that I don't "like" a cookbook, but it's even more rare to find one that I can actually incorporate into my day-to-day cooking. However, THE MOM 100 COOKBOOK is just that! I feel like it's totally geared towards me with quick and healthy recipes, options for picky eaters, lots of ideas for substitutions or add-ins, and much more. It's just so handy and easy-to-use especially given that Ms. Workman includes little "hand-written" notes on the recipes. Seriously, the cookbook uses a handwriting font with Ms. Workman's words of wisdom. It's just like a friend gave you the recipes. THE MOM 100 COOKBOOK has (wait for it!) 100 recipes that families are guaranteed to love! But in addition to all of these recipes, Ms. Workman offers some advice for mothers. The introduction of the cookbook is titled, "How to Pick Your Battles and Find Happiness in the Kitchen." I don't know about you, but I needed to read this years ago! This section also includes some helpful tidbits like "17 Amazing Ingredients" as well as some handy kitchen tricks and cooking tips. She even has a sidebar on food allergies which you already know is near and dear to my heart! The rest of the cookbook has loads of great recipes and is organized like a typical cookbook (albeit with cute chapter titles!) The chapters are as follows: Quick and Easy Breakfasts, Lunch to Stay or to Go, A Handful of Snacks, Appetizers? Really? Really, Souped Up, 4 Salads and a Couple of Vinaigrettes, 4 Chickens and a Turkey (Sort of), Main Dish Meat, Fish and Seafood, Hearty Comfort Foods, Pasta and Pizza -- the Magic Words, Vegetarian Mains, Potluck, Mixed Company Dinners, Let's Call a Carb a Carb!, Best-Shot Vegetables, Weekend Brunches, Simple Weeknight Desserts, Special Occasion Desserts, and Bake Sale. I don't think there was a chapter where I didn't find at least one recipe that I wanted to try. The page format of THE MOM 100 COOKBOOK is really special. The recipes begins with a general summary/history of the recipe, and many have ideas for how to get your kids participating in the preparation. In addition she offers lots of advice! There are helpful hints in the sidebars as well as her own "personal" notes about each recipe. In addition, there are loads of gorgeous color photographs which always take a cookbook to the next level for me. What I think I like the most, though, about THE MOM 100 COOKBOOK is just how flexible it is. And really, isn't that what busy moms need -- flexibility? Ms. Workman does a great job of giving options for each recipe. Not only does that help me with using the ingredients I have on hand, but it also gives more of a chance that even the pickiest of eaters will be happy with the dish. She also lets you know what recipes can be made ahead as well as freezer directions if applicable. I truly believe Ms. Workman has done moms a favor with all of her "extras." There is no doubt that I will be cooking from THE MOM 100 COOKBOOK many times over the next few weeks, but the first recipe that I tried was for the Crunchy Chewy Granola. It was extremely easy to prepare although it did take awhile to cook (but I'm pretty sure all granola recipes are like that.) I appreciated that the recipe was very healthy, if not necessarily low-fat (although it wasn't high fat either); and it did turn out to be delicious. The recipe used a little honey and maple syrup to sweeten it (no refined sugar) as well as the dried fruits. I added the optional fresh orange peel to give it a different flavor, but decided to leave out the optional unsalted nuts to keep the calories down. I ate it with a little skim milk, but I can't wait to eat it with some Greek yogurt. In addition to the granola recipe, I also want to try many of the main dishes. There is a chicken finger recipe that even Booking Son can eat with his food allergies that I will be making later this week. I am also anxious to make the Honey Ginger Soy Chicken, the Simplest Beef Stew, the Soy Ginger Flank Steak, and the Flaky Fish with Balsamic Glaze. Some of the more decadent dishes that look good include Aaron E.'s Favorite Apple Coffee Cake, the Caramel Sauce, the Chocolate Peanut Butter Squares, and the Best Streusel Apple Pie Ever. Ms. Workman has a website for her cookbook which is just fantastic. 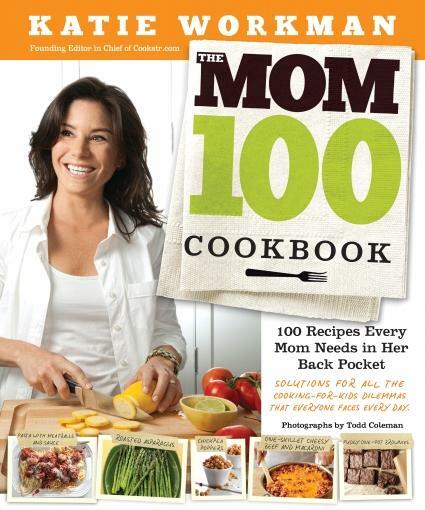 Not only can you learn more about this cookbook, but you can also check out The Mom 100 Blog. This blog has plenty of delicious recipes as well as ideas for making family cooking easy and fun! Overall, I highly recommend THE MOM 100 COOKBOOK! I absolutely adored it and consider it a must for any busy mom! I need to spend some time with this cookbook! I've glanced through it and noticed it's beautifully laid out but I haven't really checked out the recipes. It sounds great!! This sounds like it would make a fabulous Christmas present for my sisters! This is one of my favorite cookbooks and I don't even have kids!! Any cookbook that gets children more involved in food preparation gets my vote. Wish this had been around when my children were small. Oh, I sooo need this cookbook! Breakfast is so hard in my house cause my kids are tired in the morning and don't like to eat breakfast. Add to that the time limit and it's a real struggle. I'm looking this one up on Amazon right now! I checked out her blog and her recipes look awesome! Thanks for letting me know about this great cookbook! So many people love this book. I reviewed it too and really liked her flexibility and the layout of the book as well. Sounds really good might be a nice gift for my daughter-in-law this Christmas. I've borrowed this book from my library and agree that it's great! It would have been PERFECT for me about 15-20 years ago when I was learning how to cook and starting my own family. Definitely makes a great gift! So glad you liked this cookbook! I still need to go through it and see what there is for me... I'm sure if there's a dessert or baking section, I'll LOVE it.